Disclaimer! This is legal information, not legal advice. For legal advice contact an experienced landlord-tenant attorney in your jurisdiction. Any legal analysis that I do in this video is my opinion only. You can be sent the slides to the What Happens if My Tenant Dies in Maryland? video by entering your e-mail on the bottom right. What Happens To My Lease If My Tenant Dies in Maryland? The general rule is that in the absence of a contrary lease provision death of a landlord or tenant does not terminate the lease or the responsibilities under the lease. Therefore if the tenant dies, the estate of the tenant is still liable for rent. MD. Real Property Code Section 8-328 – “If a tenant under a lease dies…distress may be brought against a tenant named in the lease regardless of death.” The statute then lays out two different rules for service of process. If the tenant’s estate has a personal representative, then the Landlord must give notice to the personal representative and must certify to the court that they have given notice. If the tenant does not have a PR, then, there is a posting requirement. Practically, you can make sure you don’t violate these rules by alerting the court that the tenant is deceased as discussed below. What To Do If My Tenant Dies in Maryland? Death does not automatically terminate tenancies. Often, after a tenant dies, the tenant or her estate does not pay rent and the landlord must initiate a failure to pay rent action to reclaim possession of the rental. The District Court has a failure to pay rent form has a line that alerts the court that the Defendant is deceased. On the other hand, if the deceased tenant’s estate keeps paying for the lease then the landlord cannot terminate the lease. If the deceased tenant has a court appointed personal representative, then you can contact the personal representative to work out payments or an early termination agreement instead of going to court. Personal representatives may be willing to pay you to while they handle the tenant’s estate. You Can’t Just Do Nothing and Expect To Recover, Or Can You? For example, if a tenant just abandons a property and a landlord makes no efforts to find a new renters, then the tenant has a very strong argument that the landlord is not entitled to any losses according to the above rule. Strictly interpreted, the rule does not apply to deceased tenants. 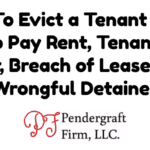 The landlord’s duty to mitigate damages technically only applies if the tenant has breached the lease in specifically enumerated ways, such as early termination. Death does not terminate leases. So there is an argument that landlord’s can hold deceased tenant’s for the remainder of the lease without attempting to mitigate damages. Nevertheless, I think landlord’s should still make efforts to mitigate their damages if they are not receiving rent money particularly for residential leases. If a landlord knows that he is not receiving rent money because his tenant has died, and makes absolutely no efforts to mitigate damages, then I’d argue that the landlord is unreasonable should not be able to recover from the tenant’s estate. And that in this case, death should be treated like abandonment and the statute should apply. In a nutshell, death does not automatically terminate tenancies so landlords must go to court to retake possession or work out an agreement with the deceased’s estate. Landlords should mitigate damages as soon as they have knowledge that the tenant has died through landlord-tenant court or by working out an early termination agreement or payment arrangement with the tenants estate. 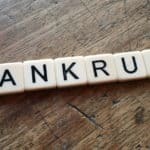 By doing nothing I think there is a strong argument that landlord’s should be barred from recovering damages due to breach of lease in the future. Need an Attorney to Help You Reclaim Possession of The Property or Negotiate With Heirs? 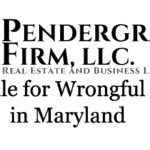 Do not hesitate to contact The Pendergraft Firm LLC. I can help you throughout the eviction process or negotiate and draft binding legal agreements with the tenant’s personal representative to help you mitigate damages after the death of a tenant. Don’t forget to download the slides to What Happens if My Tenant Dies in Maryland. Enter your e-mail to be sent the slides.